You know your website needs to be accessible, but how do you get started? 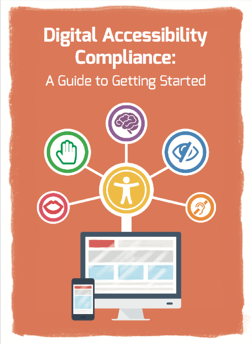 Download Digital Accessibility Compliance: A Guide to Getting Started! ADA Compliance? Section 508? WCAG 2.0? The Internet. It's kind of a big deal! If you work in a field that offers services, products, and resources to the general public, your consumers and constituents probably spend a good chunk of time interacting with your brand or organization via the Internet - your website, mobile apps, web-based customer portals, etc. But maybe digital accessibility wasn't part of the plan when you were developing all that content. You may not have even heard the words "web" and "accessibility" in the same sentence before last week. Now you know - your site/app needs to be accessible or people with disabilities will not be able to access your products, services, and all the other resources you provide. Accessibility is now a Priority with a capital P, and you have to figure out what to do next. The good news is we have your next step right here: download our Guide to Getting Started. The guide will walk you through the process of completing your early accessibility projects from kick-off to completion. We also provide some information about how Deque can help you through that project because, well, we're a digital accessibility software and services company... And if you need help, we want you to pick us! It's what we do - we love this stuff. We believe in it, and we want you to be successful because your success, whether you're providing mortgage financing or cheeseburgers, can improve someone's quality of life.